Gethin Chamberlain, in Kandahar, Afghanistan, for The Sunday Telegraph, 24 December 2006. “You’ll be fine,” his comrades tried to reassure him, pulling hard on the tourniquet they had tied just above the ragged wound. “You’ll be fine.” But it was not true – not really. It was a beautiful, crisp winter morning on the Pashmul plain in Afghanistan’s Kandahar province, the Taliban heartland and the scene of some of the fiercest fighting since the start of the war in 2001. 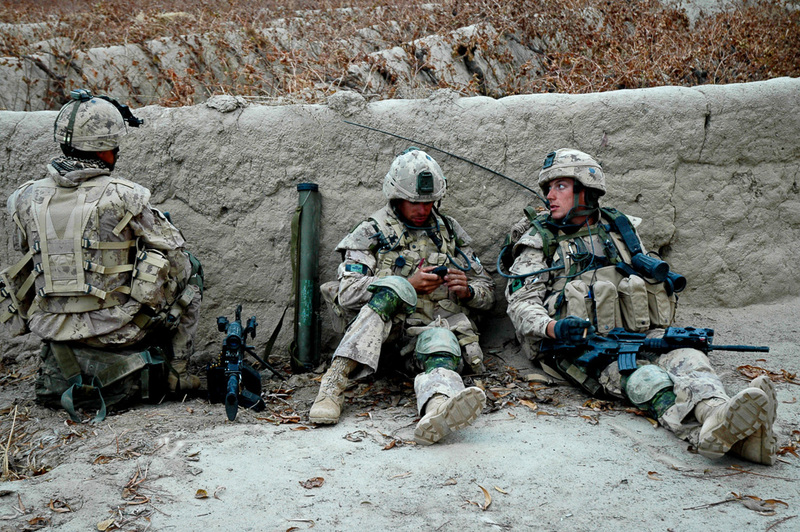 The patrol – Canadian and Afghan units, accompanied by The Sunday Telegraph – had intended to head out from a remote stronghold to assess the damage from months of fighting. It was the first day of Operation Falcon’s Summit, a campaign involving British, Canadian and Afghan troops, which was launched last week. Its aim is to sweep away the hard-core Taliban and persuade local people, who fled weeks ago, to return to their homes. The previous evening, after darkness fell, two terrorists had been shot dead while planting a bomb just 200 yards from the army outpost. It was not the first they had buried that night – but at the time, only they knew that. Soon after dawn, the army patrol snaked out on to a narrow path alongside a wadi. The track was hard where it had been trodden down. But at the sides, where the ground sloped away, the earth was looser. That was where the Taliban had buried the mine. Seven Afghan soldiers had already passed the spot when Pte Couture put down his left foot, triggering the explosion that was to change his life. From 10 yards away, the blast assaulted the senses. Dust billowed outwards and the shock wave smashed into the eardrums. Knocked off balance, those nearest slid down into the wadi, seeking cover, fearing they had walked into an ambush. Half a minute passed. There was shouting, soldiers running. Pte Couture was lying on his back across the path, his machine gun a little way away, his foot gone. But he was not screaming or shouting, just looking at the mess at the end of his leg. Shrapnel had also torn into his right thigh, but the bleeding was limited, the heat of the metal cauterising the wound. His officer, Capt John Benson, and Cpl Frederick Morissette, the team’s medic, were the first to his side. They worked on his wounds while the signaller called for a helicopter to fly him to hospital. The injured man was eased on to a green tarpaulin and handed down into the wadi. Ploughing through the thick mud, four soldiers carried him for 100 yards until they could transfer him to a stretcher and up to a waiting armoured ambulance. Pte Couture was the first casualty of Falcon’s Summit. He was taken to a military hospital in Kandahar and later flown to Germany. He had been in the army three years and now his military career was effectively over. The blast demonstrated, in brutally unpleasant fashion, the problem Nato faces in convincing local people that they are safe from the Taliban. The day before, about 30 tribal elders had crammed into a small room in a coalition base near Masum Gar to hear Sergeant Major Denis Tondreau, the man in charge of the reconstruction effort, explain how the coalition planned to deliver aid to their villages. The sergeant major tried to allay their fears but the elders were unconvinced. Areas had been identified that were safe to return to, he told them. “Where are these areas?” the elders demanded. They did not believe it was safe to return, they said. Why was Nato not getting rid of the Taliban? The answer was that the Canadians and the Afghan army were struggling to find, and identify, the elusive Taliban fighters. The elders said it would take more than a couple of days of relative calm to convince them that the tide had turned. One of the elders, Noor Mahamad, jabbed his finger at the Canadians. “You have all these weapons, why can’t you find them?” he asked. Capt Benson leaned forward. “We don’t know where they are until they attack,” he explained. And, as the next morning’s events were to prove, even an attack does not necessarily reveal the whereabouts of the coalition’s dangerous quarry.